Quickly turn any WordPress site into a donation platform with the EDD Donations extension. 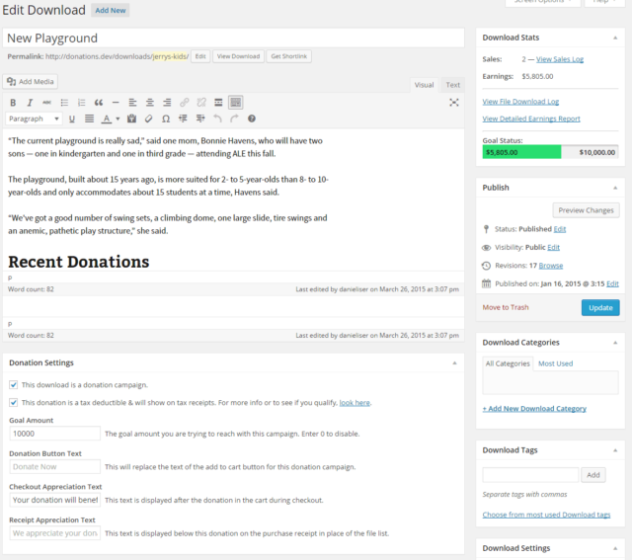 This is the most flexible WordPress donation plugin available. Create unlimited campaigns, enable goal tracking, set up recurring donations, accept credit cards & much more. The included widgets & shortcodes make it easy to create fantastic looking donation campaign pages in no time. 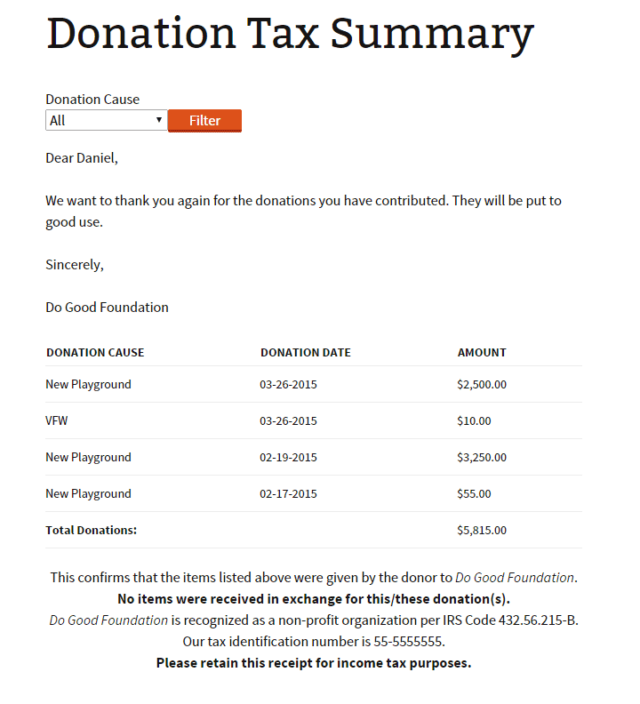 Works great with the Easy Digital Downloads Recurring Payments & Custom Prices extensions to allow extremely flexible donations to your patrons, or take advantage of the 100+ other extensions for the EDD platform to make it the WordPress donation plugin you need & want, not just the one that is available. Also included in this WordPress donation plugin is the ability to accept payments marked as donations via PayPal for 501(c)(3) non-profits to qualify for lower transaction rates. Click browse and select the downloaded EDD Donations zip file. The extension is now activated and ready for use. Navigate to Downloads -> Settings. Enter the provided license key and click the save button. 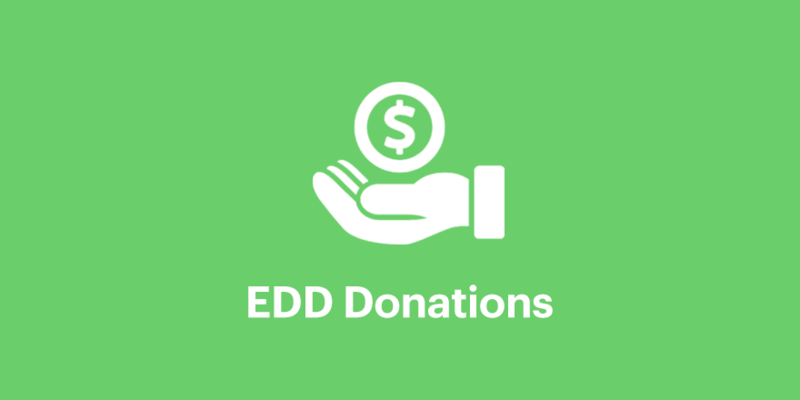 Click the Extensions tab and locate the "EDD Donations Settings" section. Configure the following available options to best suite your needs. Are your donations considered tax deductable? - Checking this means that you have valid 501(c)(3) NPO Status. This will enable extra info to be passed to PayPal to mark a transaction as a charitable donation for reduced rates. To find out if you qualify check the IRS Guidelines as well as PayPal's Donation Application. Limit checkout to one donation - If you qualify for special transaction rates with PayPal this option is required and limits checkout to one Donation. When active and a donation is added to cart, the cart will be forcefully emptied. Tax Receipt Message & Tax Disclosure are used to customize the content of your Tax Receipts for donors. You can use the same template tags available in your EDD Email messages. Receipt Appreciation Text - This is the default text that will be shown below a donation on the receipt. A simple message of gratitude goes great here. Create a new download, for more info refer to the Creating Your First Download Product guide. Set up your download as a campaign using the "Donation Settings" section with the following options. Check the box to mark this download as a Donation Campaign. If you have tax exempt status check the box to mark it as tax deductible. You can also customize the Buy Now button text, as well as add appreciation messages for both checkout and the receipt. 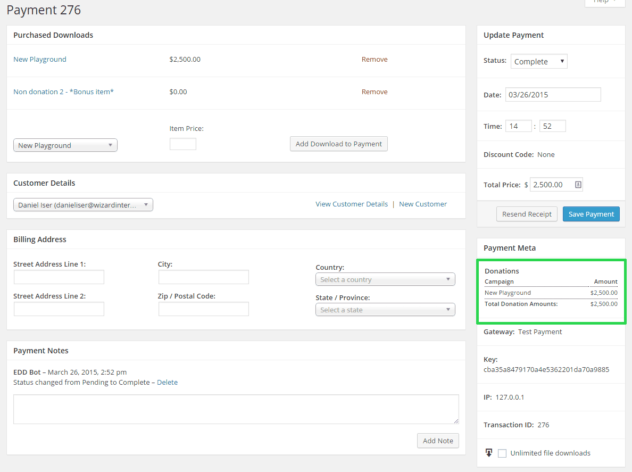 If you have the Custom Prices or Recurring Payments extensions you can set up those per their guides. 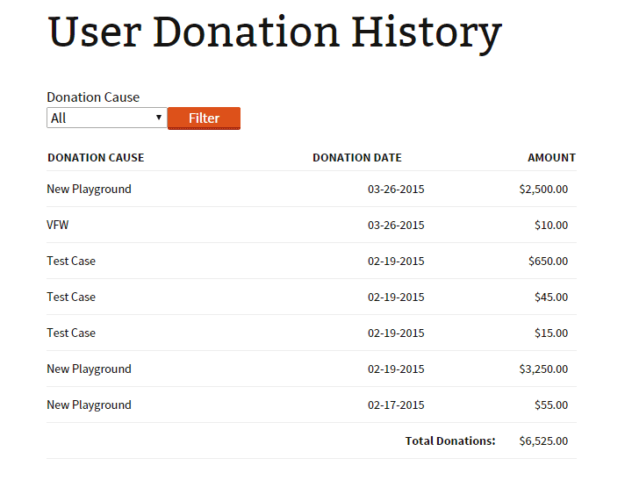 [donation_history] - Shows a users personal donation history. Is filterable by donation campaign. If no user is logged in this will show nothing. [recent_donations] - Shows recent donations to all or just one specific donation campaign. id: int $download_id - default NULL - If NULL current download ID is used. limit: int $limit - default 20 - Limit the number of recent donations shown. [donation_tax_summary] - Shows a tax receipt for all donations for the current year with a filter for showing specific donations. [donation_goal_progress] - Shows a goal progress bar for the current or specified donation campaign. title: int $title- default NULL - Title text to be shown above the progress bar. [top_donors] - Shows a list of top donors for one donation campaign or all. id: int $download_id - default NULL - If NULL current download ID is used if on a download page. If NULL and not on a download page then top donors for all campaigns will be shown. limit: int $limit - default 20 - Limit the number of donors shown. Can I accept recurring donations? Can the user enter their own donation amount? 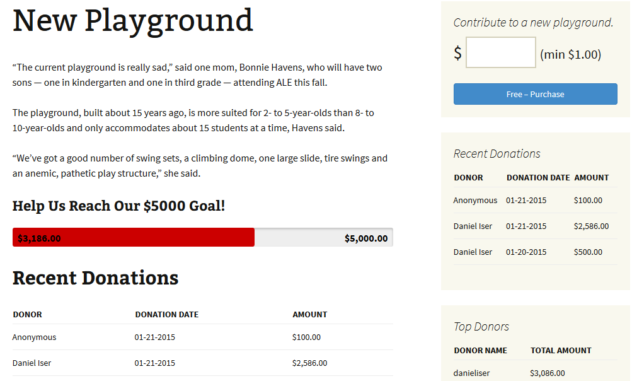 Allowing your users to donate a custom amount is very easy with the EDD Custom Prices extension. Does this work with PayPal's lower non profit rates? Absolutely, payments in the system marked as donations will automatically be processed with lower rates by enabling the "Are your donations considered Tax Deductable" option. Ready to start accepting donations now? 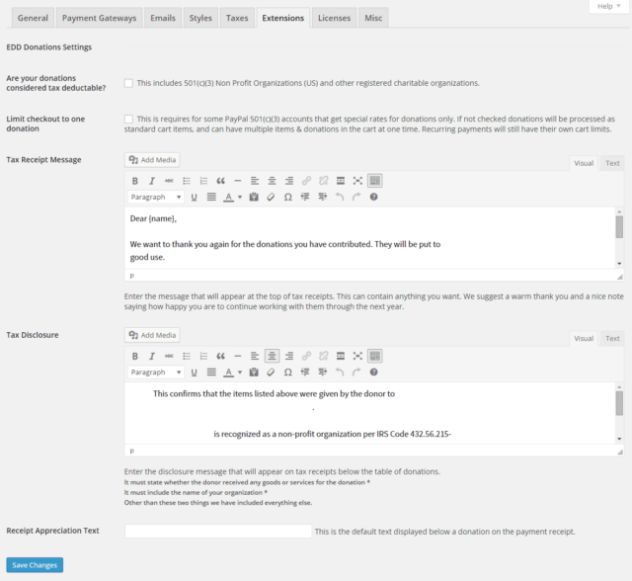 You are minutes away from having your own personalized WordPress donation platform. Buy Now & Get Started! how does a donor enter in how much to donate? @mickhansensj – This depends, if you have the EDD Custom Prices extension then their will be a box for them to enter any price, if not you can set up predefined amounts using variable pricing that is built into EDD. Does that answer your question? Dear Daniel. Yes it does. I would have thought a donation extension would have entering a donation amount an obvious choice for donors – more so then set amounts. It begins to become an expensive enterprise to add Custom prices to your extension. Do you plan to add this basic option into your extension? I will likely be back to you as I am new to EDD and will likely need help is getting right button titles etc. Also, a beginners question. 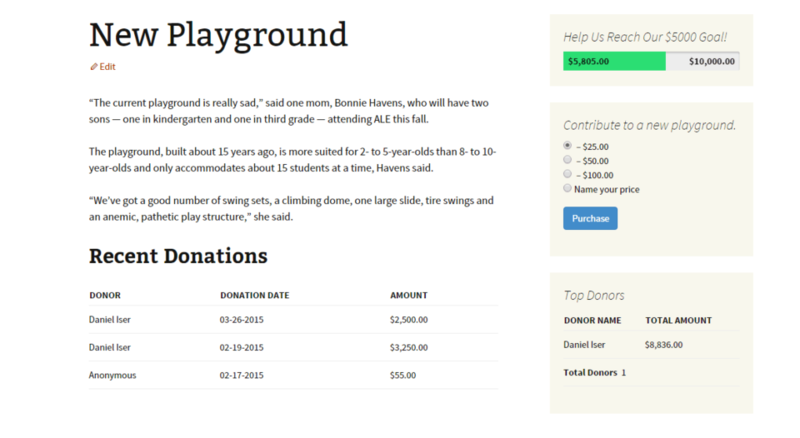 Do I create a special donation page on my site or can I just put short code in a donor page I already have? 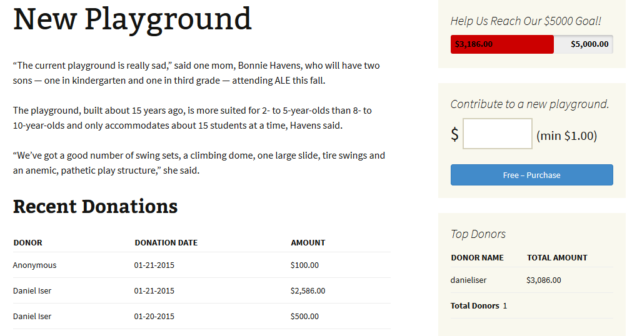 Or is there a Donate button I can put anywhere in my site? @Michael – Firstly, I don’t think the custom price function will end up being added, simply because the functionality already exists in another extension, nearly all of the extensions are built to work together and I was asked to respect that when creating this one. Same for recurring payments as their are already existing solutions and not everybody will need them. Second I am always around and can help with anything you need. With this plugin there are a huge combination of ways you can show it. There are several widgets and shortcodes which can be used to show donation information anywhere, couple that with the existing EDD widgets/shortcodes for purchase buttons and you can set it up any ways you choose. PS if you haven’t already install EDD and opt in to the tracking when first installed, you will get a 20% discount coupon emailed to you immediately, buy all of the extensions you need at one time and apply it then. On top of that if you buy 3+ extensions they offer another 10% off I believe. I have used that combination before to save enough to essentially get a free 3rd extension. Daniel, Thanks, most helpful. Respecting other extensions makes it clearer. And great to know you are around – as you are now. Into the learning curve first. Hey Michael, quick tip for you, if you either uncheck the optin via EDD Settings page and optin again or simply install EDD on another site that your admin of and optin there you will get an additional discount code. Then simply remove it from the second site. Of course if you don’t need the additional plugins then no since in going through the trouble..
Will be around if you need any help, and the EDD support team is fantastic if you need help as well. I have EDD, Custom Price, Donations and Recurring Payments – but not everything seems to be integrating with one another at all… the Custom Price isn’t being passed to the checkout, nor is the minimum amount being checked (I can press Donate with £0). Confusingly, the template I am using already had their own ‘custom’ price input that you could add, so that may be getting in the way. Either way, I want to use the actual EDD plugins to get this to work correctly – can you help please? I used your plugin on my own website. Actually one question for you: i create new download and use shortcode ([purchase_link id="285" text="Donate" style="button" color="orange"])in text widget, but this is not working. Can you explain me how use shortcode in widgets. 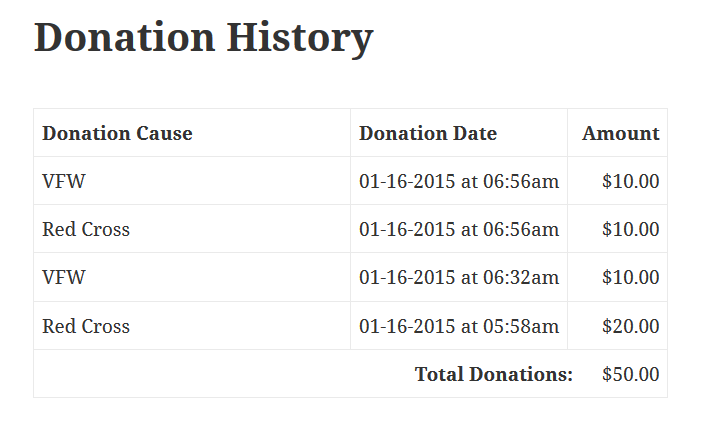 The shortcodes don’t work in my site so I have no way of knowing/getting donation history. It is interesting to see that there is no new client in the customers page, but there is a donation made recently in the website. Is there any way to donate anonymously? Maybe the “donater” did it anonymously. @Eric, Are the widgets having the same issue? Can you email me directly & include a link where I can see it in action. Hi, I wanted to know if these amounts are reflected in the EDD earning reports so basically if I open my EDD app my today’s earnings will be taking donations into account. Thank you. Hey John. Your correct that they will appear in your daily revenue. That said because we tag the as donations you can easily filter them out. I’ll do some research with the edd team to see what our options would be and if there is an ability to prevent these from counting as revenue for a future update.